CartoGIS Services produce high quality maps and diagrams to support education, research and outreach. Our maps and diagrams are customised to your needs and suitable for use in your lectures, research publications, books, theses and presentations. Below you will find examples of the variety of maps and diagrams we produce. Base maps made by CartoGIS Services can be downloaded via Maps Online. Contact us to discuss your specific map and diagram needs. Please use the online request form to request our services. A map created for the 40th anniversary of the independence of Papua New Guinea (2015). 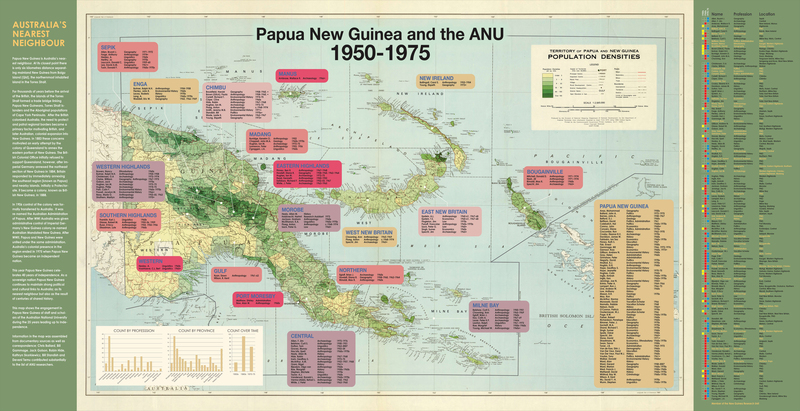 The map utilises a 1970 population density base and shows the engagement in Papua New Guinea of staff and scholars of the Australian National University during the 25 years leading up to independence. Download a pdf file (pdf, 18.5 MB). Download a jpg file (jpg, 19.1 MB).